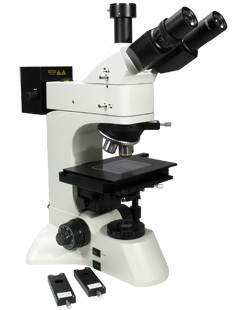 The SP400 series has a range of accessories available from our online shop. 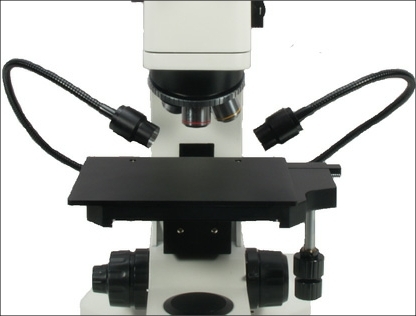 The Brunel SP400 series are quality multipurpose universal microscopes that have a range of illumination options including brightfield, transmitted and incident and darkfield incident illumination systems. The objective turrets are equipped with excellent infinity corrected plan objectives (non coverslip), that are parfocal with spring loaded elements in the x40 and x60 lenses. x80 and x100 (dry) objectives are available as accessories. 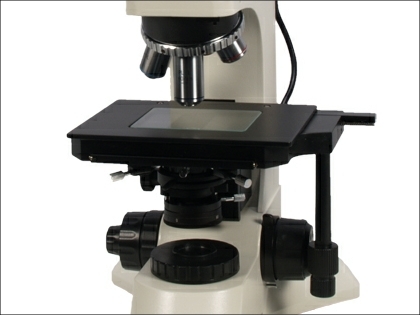 The SP400 series are supplied with x10 widefield eyepieces as standard. 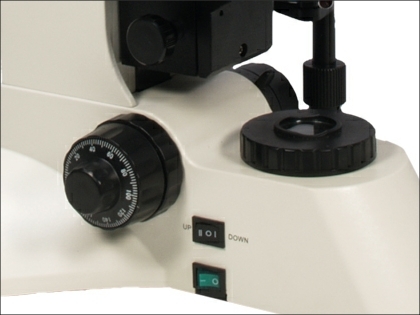 x15, x20 and measuring eyepieces are available as accessories. The large rectangular mechanical stage has long arm drop down controls and a removable glass plate that allows transmitted illumination and also serves as a support for opaque specimens. The substage condenser (SP400L & SP400BD) is fully focusing and centring with iris diaphragm and filter carrier. The transmitted lighting (SP400L & SP400BD) is 6 volt 30 watt quartz halogen that is rheostat controlled The field iris allows Kohler illumination. 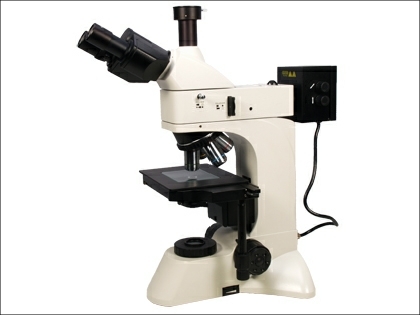 For polarised lighting the field lens is capped with a polarisation filter. The incident illumination system incorporates a separate light housing with 6v 30watt quartz halogen source for the SP400 and SP400L and a 6v 50watt system for the bright/dark field (SP400BD) unit. A recent innovation is the option of LED based lighting systems as an alternative to the traditional halogen lighting. This is available at no extra cost but has to be chosen at the time of purchase as it cannot be retro fitted. The bulb filament can be accurately positioned using the lamp housing adjusters. The incident light path has an adjustable focus lens, double iris with centring mechanism. There is a rotating plate with filter options. The SP400L can also be supplied with DIC for the x10 and x20 objectives. The SP400A, in addition to the incident lighting system has two side arm goose neck LED light sources. These are ideal for the examination of more soft material such as plastics and cloth that do not have the reflection capabilities of metals. This avoids the relatively low level of reflected image light being swamped by the coaxial illuminating light from the standard incident lighting system. The SP400A has both illuminating options. Within the trinocular head is an analyser filter that can be inserted via a push/pull lever into the optical path for both the transmitted and incident illumination. The analyser is fully rotating via a linkage to an external graduated thumb wheel. 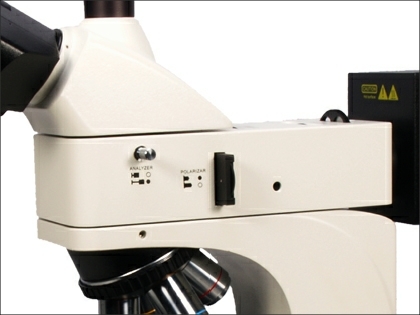 The analyser can be removed from the optical path for plain polarised lighting. The trinocular tube will accommodate adapters for CCTV and digital still cameras, including a parallax system for SLR camera backs. A push/pull lever diverts light via a sliding prism to the camera tube. 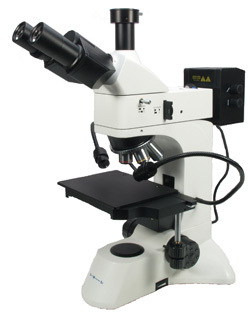 The SP400 is a modern design series of instruments with an excellent optical performance at a very affordable price. At an additional cost of £360 + vat, the SP400L can be supplied with a stage that has an exceptionally long drop down distance that can accommodate deep specimens such as a laser chamber or alternatively extra long Mitutoyo type objectives . Must be ordered at the time of purchase cannot be retro fitted.